I’ve had a little time to allow last weeks experience to digest and I wanted to share a few things with you all. To some of you this will be a boring read because you are already ahead of me in your advancement as a player. To those individuals I would ask that you simply understand that I am only trying to help newer players understand what they really need to know to be successful, and that I spent hours of my life writing this piece to try and help them grow. Last weekend was my first experience playing in the AM1 (Advanced) division at the Amateur Championships at Bowling Green. For us amateurs that live in the south, this is the Super Bowl of our discgolf season. All the big fish from little ponds all over the country swim out to sea and enjoy golfing with one another. This coming together as players gives us an opportunity to see how much we have grown since last year, and helps us know what areas we still need to work on in the future. This yearly self assessment can be painful, but usually it is just our pride that takes the real beating. For me, having the opportunity to be with so many great players and understanding that I truly belong among them helps alleviate this pain. It also provides motivation for me as I continue to grow in the game. I believe that if you are still reading this, then you want more out of the game. Most of those people that just see the game as a hobby or an excuse to drink with their friends have no real interest in improving. We are not like them. We like to master things and make our mark. I’m going to list a few things that I believe are critical points to master as you climb the ladder towards reaching your true discgolf potential. These are habits that I have observed over time from players much greater than myself. While most are very simple in nature, I believe that each one is an absolutely critical step towards mastering this game. An important thing to remember is that as you climb each step of the ladder; you would do well to work on continuing to improve in the areas below your current level. Constantly looking ahead is for prophets and dreamers. The wise man knows to always pay attention to where he is at now. He makes plans for where he is going but he remembers where he has been and all the effort it took to get him this far. Beginners are usually very excited about the game. The joy of playing may soon fade as they see how good the other players are but keeping our zeal for the game is the first principle towards becoming a great player. Passion is real and cannot be faked. Passionate people are exciting to talk to and they bring a contagious energy into whatever it is that they love. Our very best players are genuinely passionate about the game. They enjoy the experience, and you should to. If it ever starts feeling like work, take a break. Go do something else for a few days and come back to it when you feel the urge. Maintain your passion for the game. It will be the fuel to your fire for years to come. Principle number two. Putting. If you truly want to get better at the game, you need to learn right now that 50% of your practice time should be allocated towards putting practice. Throwing drivers is fun so most new players spend most of their time doing exactly that. There are many others that are much more qualified than me to teach you the correct way to putt. I personally recommend the Mark Ellis putting confidence program and the Dave Feldberg putting clinic videos. But the important point I want you to take from this is that if you want to win, you have to be able to put your second or third shot in the basket from 20’ away. Work from in close outwards as you practice and never rush yourself. Train your mind to treat each practice putt as if it was an actual putt during a round. Develop a rhythm, and keep that same rhythm as you play actual rounds. Practice like you play, and play like you practice. Principle number three. Learn to throw the three basic shots of hyzer, flat, and anhyzer with whatever mids and drivers you choose. 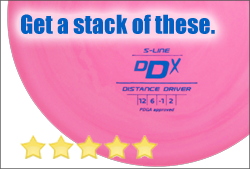 It doesn’t really matter how far you throw them yet, just work on throwing a neutral flying disc by bending slightly over at the waist (hyzer), standing straight up (flat), and bending the spine backwards by arching your back (anhyzer). Most new players use disc selection to produce the flight path they want. Learning these basic fundamentals up front will give you a strong foundation to build upon. Do not change your grip or pull through, just work on throwing the same disc all 3 ways by bending at the waist. By learning how to shape your shots by using your body to shape your throws, you will be a leg up on your fellow players. You will have inadvertently learned the lesson that it is in fact the Indian, not the arrow that is most important. Principle number four. Be still, and observe. If you did the three above, you probably flew threw the entry level ranks. In Intermediate there are players of all skill levels. Some are beginner players that moved up because they didn’t want to be called Beginner or Recreational. Some are truly Advanced level players that have issues with their game that they are either unwilling or unable to fix. Most of these guys have confidence issues but are too proud to ask for help. Vow to yourself right now that you will never be “that guy” The important part for you to take from here is to pay attention to your fellow players. Beginning at this level, you can observe and take skills from other player’s games and add them to your own as you see fit. Why does that pro use a thumber on hole 10? How does player X throw that roller? Asking questions will assist you in growing as a player and all you really have to do is pay attention and humble yourself and ask. Not everyone will help you, but most people really, really love to talk. So all you have to do is ask and enjoy the show. Principle number five. Learn the courses. You are far enough along now that understanding the concept that you are playing the game of golf and not participating in a distance competition will get you good results all by itself. A common trait of good players is scouting the courses they are about to play. A simple walkthrough before the round will enable you to see the course with an observant eye. One helpful trick is to stand by the basket and look back towards the tee pad. This will allow you to better gauge the fairway and see flight lines that may not be apparent from the tee itself. The more you travel to play in tournaments, the more this will come into play. You will begin to recognize similarities in course layouts and will often be able to say something like “This is just like hole X back home…”. Good players think about and plan out how they are going to attack the course before they ever throw their first shot. If the best angle to the hole for the second shot is only 100’ away from the tee box, tossing your putter to put yourself in that position will give you an advantage over those that don’t have that knowledge. Principle number six. Shot selection vs. disc selection. This is a difficult one to grasp because it is a constantly moving target. As our discs beat in over time their flight paths are altered. 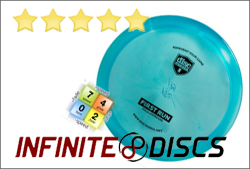 The constant introduction of new discs just complicates the issue by adding more variables into the mix. Wind plays a huge part in telling us what shot to use and the disc we need to pull it off. We also often fall into habits of repeating what has worked for us in the past without stopping to consider the current conditions. Remembering Principle number three and applying it will often be the difference between continuing to grow at this level vs. stagnating. Most true Advanced players already have all the skills necessary to become a Pro but they oftentimes lack the confidence, consistency, and good decision making necessary to make that final leap. I believe that learning and mastering this vital skill is one of the final keys towards becoming a great disc golfer. Principle number seven. Understanding your limits. I’ll close on this one. This is counterintuitive to Principle number four, but vital if you wish to continue the growing process. At some point, you have to be what you are. If everyone else in your group throws a big hyzer around the trees, but you know that you are accurate enough to punch down the center and give yourself a much closer putt, then sometimes you just have to make that call. As you continue to play over time you will develop certain natural skills that are unique to you. Your game is inherently your own, and you get to shape how it will develop. Playing within yourself is a huge part of developing consistency and absolutely necessary to making the jump to the next level. Unwritten... I hope to one day soon be able to add more for you here, but I am not qualified to speak on this level yet. Okay, so lots to process in there for guys like me who are trying to claw our ways through the various levels of play. My brother and I were just talking about our state's top ranked player. He talked with him during last weekend's tournament and he basically said he took 2 years of just field work getting his game dialed before playing any tournaments. I fully get it too, because when you do the field work it pays off. The guy who hits that miracle 100'er... probably more practice than divine intervention.